Recently, there has been some decent press around the Fasting Mimicking Diet, (FMD) developed by Professor Valter Longo at the University of Southern California. The FMD is a way to fast for long periods of time but removing the need to eat nothing or only water; you eat minimally each day to gain the benefits but eliminate some stress due to hunger. If all the research is to be believed, these are amazing results! I of course had to try this and see how it go, and what results I might observe. First, I must say that while I’ve been intermittent fasting (IF) for a long time now via a 16 hour fast/8 hour eating window pattern, I had never done a multi-day fast before. The longest I’ve ever fasted was 24 hours, which, after years of IF, was not a big deal to do. Now I was going to up that to 5 days. How would my mind and body react to that? Note that FMD protocols say you can fast from 3 to 5 days and still get the benefits. I chose to extend my FMD to the maximum of 5 days and see if I could do it. My buddy Quantified Bob tried the FMD and provided a nice spreadsheet to follow. Here is mine, based on his spreadsheet. I was glad to have his advice. I found out that there are others trying the FMD with other variations on the food composition. Longo is pretty vegan/vegetarian and thus his prescriptions are very much not eating meat. I chose to keep to the vegetarian prescriptions that Longo and my buddy Bob followed. I also didn’t drink any coffee, although some have added that with no apparent negative effects on the results. About a week before Thanksgiving 2018, I started the FMD. I only took body composition measurements through the whole process – next time I’ll try to test more like blood glucose and ketones. 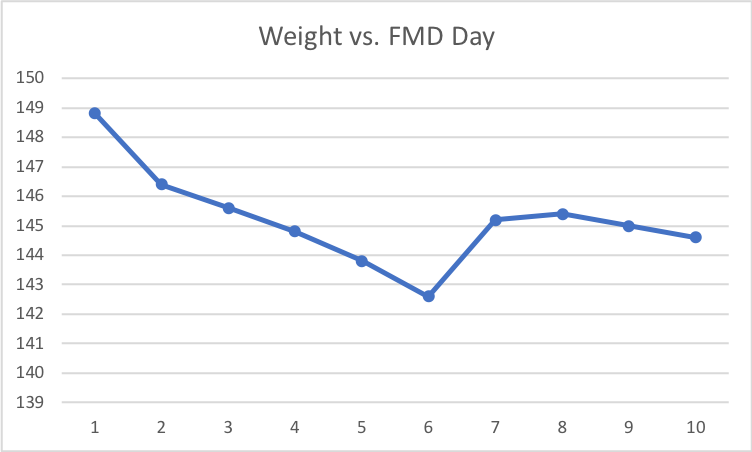 Note on Day 6, the day after I stopped the FMD, my weight continued to drop to below 143 pounds, the lowest weight I’ve recorded in a decade! 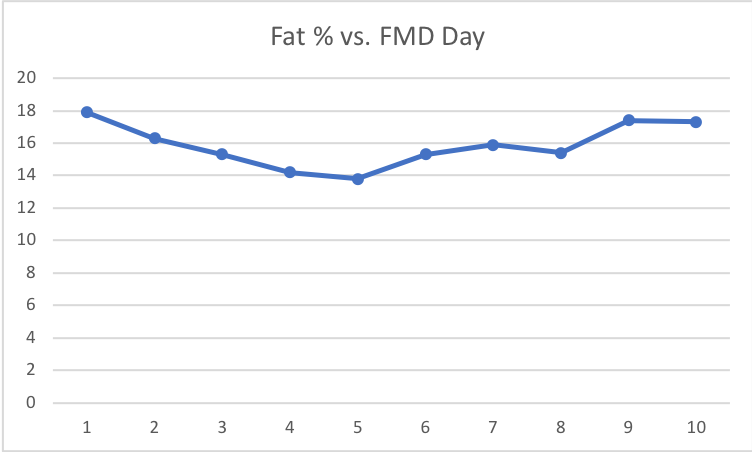 On the last day of the FMD, I also recorded the lowest body fat percentage. Nice to see I could drop an index number for visceral fat. Here’s a typical meal. Pretty sparse and pretty much the same thing every meal, every day! Things really didn’t move until after day 3. It leads me to believe while some results may be achievable with only 3 days of FMD, taking it up to 5 really makes things shine. Others have told me day 1 is the toughest. It thankfully wasn’t for me. I had these weird expressions of my habits which relate to eating. I’d find myself almost starting to go through the motions of preparing coffee, or my usual bowl of berries. I held myself to the spreadsheet of prepared and measured out foods but always could feel myself wanting to reach for other stuff I would normally eat. I followed Quantified Bob’s advice to keep things simple. 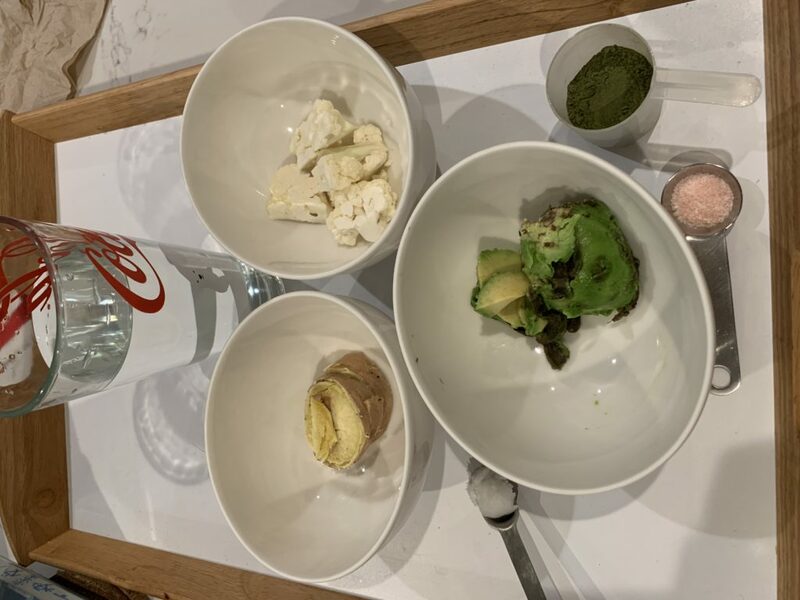 While the FMD only have daily calorie and macro breakdown requirements and could have been achieved through any combination of foods, I chose to limit myself to eating only a small set of foods which were the same that Bob ate. This worked really well, kept things simple, and easier to manage. I found that remarkably I would feel full on such tiny amounts of food, relative to what I normally would eat. I trained twice during this period and didn’t experience any kind of energy drops. I was happy for that. I retained my intermittent fasting throughout my FMD, which simplified things even further by only eating two meals a day versus three. I was most gratified to see my visceral fat drop from a 7 to a 6 on my Omron. I have found that my visceral fat number is the hardest to move. 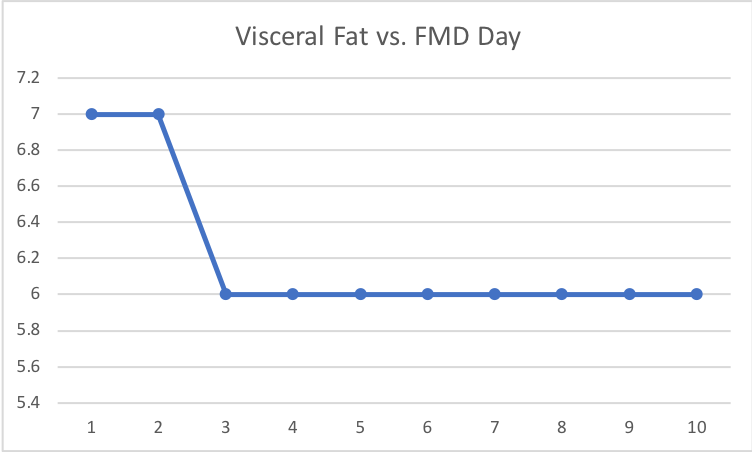 Of course I am a bit dubious as to the Omron’s measurement of visceral fat, but still it is nice to see this number drop. Upon coming out of the FMD, I felt really warm overall. I am not sure why this was. I can only hope it was having a rebooting effect on my thyroid which I’ve been trying to address for over a year now. My measured body fat % also dropped to its lowest point ever of 13.8%. I liked this a lot! It did come zooming back upon re-feed and in subsequent days of normal eating. How does one observe the other effects like autophagy and a reboot of the immune system? Pretty hard I think. I don’t have any known conditions I’m dealing with at the moment so hard to see a major shift in something I could perceive. As mentioned previously, the next time I do the FMD, I will try to measure more things like gut bacteria, blood glucose and ketones. And I will hope that good things are being renewed in my body through the fasting process, although not necessarily perceivable to me.